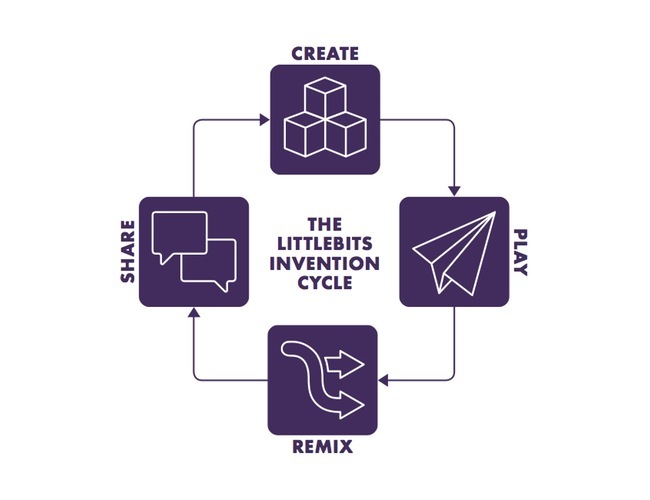 A littleBits workshop is an awesome way for students of all ages to invent, learn by doing, and think in fresh ways about the world around them. Workshops offer a chance to engage in the design thinking engineering process to identify opportunities for invention, building prototypes, conducting user testing, iterating on ideas, and, finally, sharing it with the world. Most importantly, workshops are FUN! They are opportunities for people to be silly, try out wacky ideas, make lots of mistakes and let their imaginations run wild! The Invention Cycle is a roadmap for your invention journey. Each phase is full of activities and questions that help you explore your ideas and develop your invention. if it doesn’t work or if it isn’t perfect. The important thing is to create your first model so you have something to experiment with. Use it! Playing with what you’ve created is fun, but also an important part of inventing. Playing is like a test run. It’s a chance to see how well your invention works and look for ways you can make it better. Improve your invention. Keep experimenting! Add new Bits, swap parts with other inventions, or take all the pieces apart and put them together in a different way. Inspire others. Show the world what you’ve created. Get inspired by exploring what others have shared. Create, play with, and remix other inventions. This is how awesome new inventions are born.